With Becky and Lani at Sunrise Park. "Salt water cures everything," exclaims Davey Blair as he climbs back onto his boat on a blazing hot Friday afternoon in mid-August. The air is sticky and almost still, but the professional kiteboarder still manages to find enough wind on Charleston Harbor for his 15-meter kite to pull him across the water near Castle Pinckney. On days when it’s really blowing, Blair can be found soaring over the ocean at Folly Beach, practicing the aerial maneuvers that have made him an internationally recognized kiteboarder. His primary sponsor, Naish, is one of the most respected adventure watersports companies in the world, and its founder, Robby Naish (the man who pioneered windsurfing on big waves in the 1980s), personally chose Blair to represent his brand. 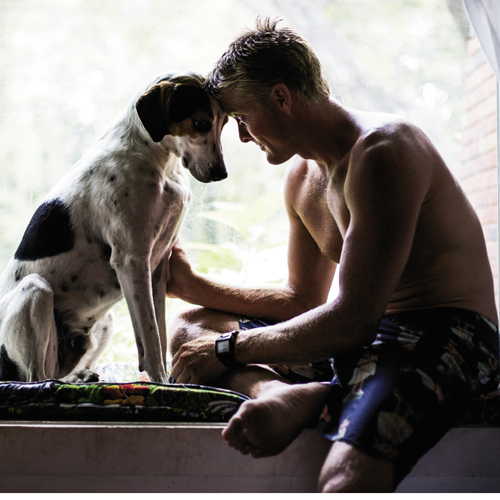 Despite the glory of traveling the world on an expenses-paid ticket throughout his twenties, competing in tournaments from Australia to Hawaii, Blair is now content to stay close to home on James Island with his wife, Becky, and two hound dogs, Hanai and Lani. But his afternoons and evenings—after long days building and restoring homes—are anything but ordinary. 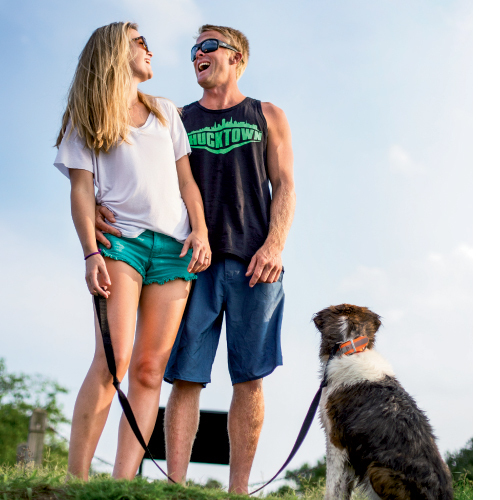 Today, at 30 years old, Davey Blair owns a homespun lifestyle apparel company (Chucktown) and is a recognized name throughout the world’s kiteboarding community. Not long ago, however, he was just another Mount Pleasant kid skateboarding in his Snee Farm neighborhood after school. He dreamed of becoming a pro baseball player and spent his weekends surfing on the Isle of Palms during his high school days at Wando. Blair’s life changed just before graduation in 2003, when a kiteboarder leapt over him in the surf. The sport was virtually unknown in South Carolina, and Blair had never seen anything like it. Stunned, he went home and asked if he could have a kite for his graduation gift. Within weeks, bloody and bruised from teaching himself to ride before lessons were available in Charleston, he had discovered his calling. Most importantly, Cabarete let Blair hone his skills. Just as his money began to run out, he caught the attention of a representative for Gaastra, an upstart kiteboarding gear manufacturer. With his gutsy mid-air tricks, he stood out from the other riders, and Gaastra offered him free kites and a modest travel budget to enter tournaments around the world. “Hooking up with Gaastra was really the ‘Whoa’ moment that gave me a light, where I said, ‘Maybe this whole dream to be a professional athlete could be a reality,’” says Blair. With the support of a sponsor behind him, the still-teenaged dreamer abandoned plans to move home and headed instead to Oahu’s North Shore—where he could chase big waves and big wind—arriving on a one-way ticket with just his boards, kite, a snorkel, and four pairs of board shorts. His next seven years are a blur. Less than 12 months after his run-in with the kiteboarder on Isle of Palms, Blair was now riding among the world’s elite, competing in tournaments from Portugal to Indonesia. His biggest victory came in 2003, when he won the Velocity Games in Corpus Christi, Texas. By 2007, at age 23, he was voted the No. 10 wave rider in the world by SBC Kiteboard magazine. “All I had to do was wake up and kiteboard and surf, and I was getting paid,” admits Blair, still with an air of disbelief in his own good fortune. 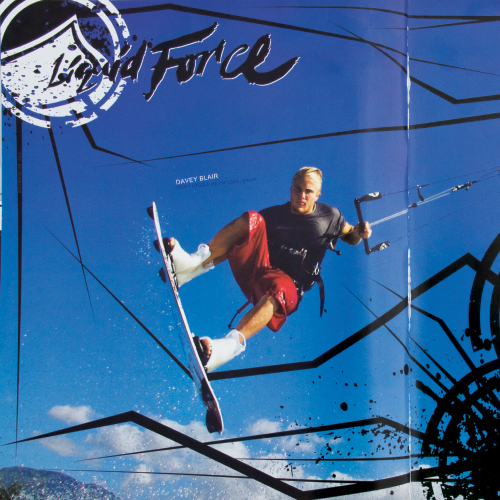 In Hawaii, Blair picked up other sponsors, including a detox shake called Rebootizer and board-maker Liquid Force, eager to splash their logos across his flying billboard. He even turned down a modeling deal with Abercrombie, out of concerns for what his friends would say (a decision he now admits was questionable). With sponsorships putting food on the table, he devoted himself to kiteboarding, building the respect of Hawaii’s veterans on windswept, potentially dangerous days when he’d be out by himself, kiting on massive swells too choppy for paddle or Jet Ski tow-in surfing. For years, Blair touted his Charleston roots in the islands, pasting “Chucktown” onto his boards and eventually making hats, stickers, shot glasses, and even hot sauce with his hometown’s moniker (he was savvy enough to trademark the term early on). 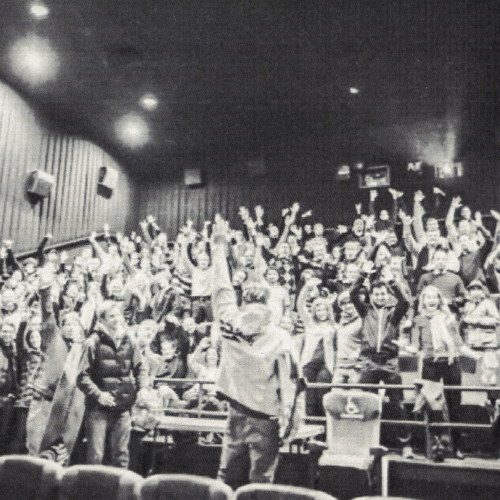 Dating back to grade school, Blair drew Chucktown logos in his notebooks and referred to his group of friends as the “Chucktown boys.” “It was always about camaraderie and bringing the crew together,” says Blair of the nickname’s connotation. Big surf aside, he soon decided to return to South Carolina after he headed to Cape Hatteras, North Carolina, for the annual Triple-S Invitational tournament (the top national competition and an event chronicled in Charleston filmmaker Adam Boozer’s 2013 documentary With A Kite, featuring Blair and narrated by Sir Richard Branson). It was there, in 2010, that Blair met Becky, an employee at the local kiteboarding shop. “I knew right away that I was going to spend the rest of my life with her,” he professes. So Blair came home. He began working construction jobs—putting his childhood experience building skateboarding ramps to good use—while keeping up a light tournament travel schedule on the side. In April 2013, he married Becky at Magnolia Plantation, and they bought a home—a small ranch with a view of the municipal golf course on James Island—one month later. “I’m surrounded by love, friends, and family,” he says of his life today. It’s Saturday morning at the Blair household, and friends are filing through the front door with coolers and boards, ready to head out on the Stono River for a day of wakesurfing behind the boat. The Blairs’ house conveys a welcoming, communal atmosphere, where an hour or two of fun on the water quickly overwhelms any lingering workday drudgery. Before heading out, Blair sits down at his sewing machine to mend a buddy’s ripped board shorts. His makeshift office serves as the factory for Chucktown’s apparel, where he hand-sews patches on hats and shirts. On the walls, newspaper and magazine clippings share space with plaques and mementos from his world travels. Although growing Chucktown into a viable company has taken a backseat to the priorities of marital life and a weekly paycheck, Blair aspires for the brand to develop and become his full-time focus. 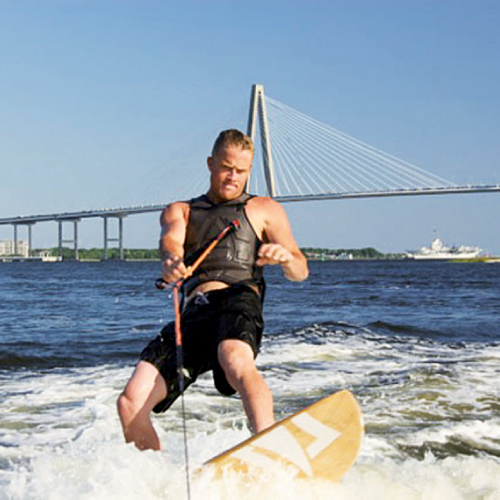 For now though, he’s still busy living the “Chucktown lifestyle” himself, from riding dirt bikes to flounder gigging to wakeboarding at John’s Island’s Trophy Lakes, and, of course, fitting in a healthy dose of kiteboarding. 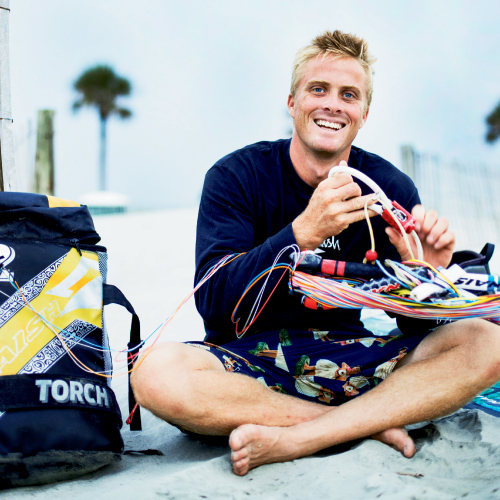 He’s also a sought-after instructor, teaching one-on-one kiteboarding lessons, with the aim of spreading the sport in Charleston and ensuring that everyone on the water with a kite knows how to handle themselves safely. His pie-in-the-sky dream is to one day open a camp where kids can learn “how to shred,” whether via wakeboarding, riding dirt bikes, or playing paintball. “I want to pass along what I’ve learned to the groms [young boarders] and help steer them in the right direction,” says Blair. That direction will always point toward the water. When the wind or waves are kicking, it’s a given that he’ll be outside, constantly pushing himself to new extremes. “My friends either pick up the phone when I call, or put it down because they don’t have the energy,” Blair laughs. “I just want to stay stoked and work enough to lead the life I want to live.” Parrot’s Vlcek confirms that claim. “Davey’s always ready to go for the next adventure or shot of adrenaline,” he says. Even as the water sportsman settles into a more “normal” life, there’s no shortage of adventure in an average day with Davey Blair. 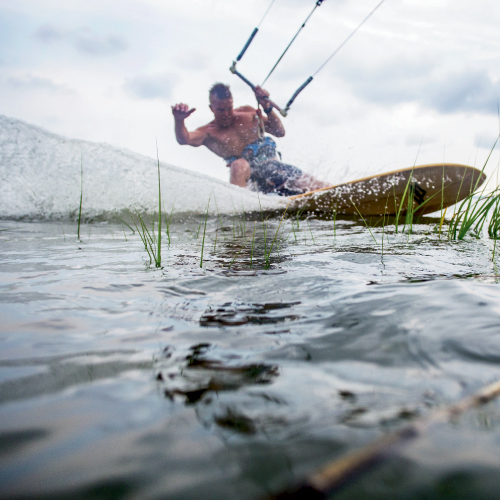 This fall, he’ll kite at Hood River in Oregon with his wife, compete in the REAL Watersports Cape Hatteras Wave Classic in the Outer Banks, and be photographed riding the windswept Canadian lakes around Whistler, British Columbia, for Naish. Despite it all, he maintains that his hometown is a top-five kiteboarding location in the world and the perfect place to live the Chucktown lifestyle he holds dear.